In addition to the to-be-resolved relationship with the grandparents, the kids are also suffering after their father abandoned the family five years earlier. They’ve repressed it in obvious but no less real ways, and the events of the film will help them to deal with their particular fears as only the ironies of psychological horror movie hells can. Because when the kids get to the grandparents’ house, a lonely cabin in the woods, things, it quickly becomes apparent, are not exactly as they seem. With a narrative as ancient as Hansel & Gretel, Shyamalan plays upon our terror of the ways the human body inevitably breaks down. The subjective camera of the found-footage genre gives him remarkable latitude in experimenting with space, both off-screen and on-, while deft uses of computer screens and mirrors and the two kids’ cameras allow us to see the characters get snuck up on without ever leaving their POV. Shyamalan’s always had a genius for suspense construction, and he lets loose with all the scare tricks he can muster: shock cuts and jumps into the frame, ominously slow and inhumanly frenetic POV movements, chillingly creepy imagery, discordant and dissonant scoring. The gasps he elicits are as much of recognition of the elegance of the shock’s construction as of the neurological jolt of the scare itself. Shyamalan has always shown a felicity for drawing exceptional performances out of child actors (Haley Joel Osment in The Sixth Sense and the kids in Signs to name the most obvious) and he’s done so again with young Australian actress Olivia DeJonge as Becca. She’s smart and pretentious in the right proportions for a teenager with dreams of artistry, with angry eyes concealing deep sadnesses. Ed Oxenbould is less nuanced as Tyler, but he’s very funny and while most of his dramatic scenes are shot either from his point of view or just behind him, he does get one close-up scene of blithe denial that he pulls off quite well. This is what distinguishes The Visit from a horror-comedy like The Cabin in the Woods: both films are cleverly constructed and quite funny, but there’s a deeply-felt emotional core to Shyamalan’s work that comes all too rarely to the Whedonverse. The deep sadness of Signs and the Bruce Willis films is here in spades, each generation mourning its lost connection with the other, a family split apart for no good reason and unable to be reconciled. In the trial-by-ordeal logic of the Hollywood horror film, we’re left in the coda with some hope that the traumas the kids are put through on their trip will help them resolve their issues, but while Shyamalan gives us Becca smiling as she brushes her hair in the mirror, the fates of the other family members are less certain. It’s still a very funny scene, one that you couldn’t imagine in his oh so somber earlier films. Shyamalan’s attempts at humor have tended to either go unnoticed or simply fall flat. For the first time he’s made a film that demonstrates all his strengths with efficiency and grace (not unlike Noah Baumbach with the similarly sleek and better for it Mistress America). Like many an artist, a return to basics, with the constraints of budget and general, have produced a career-best work. 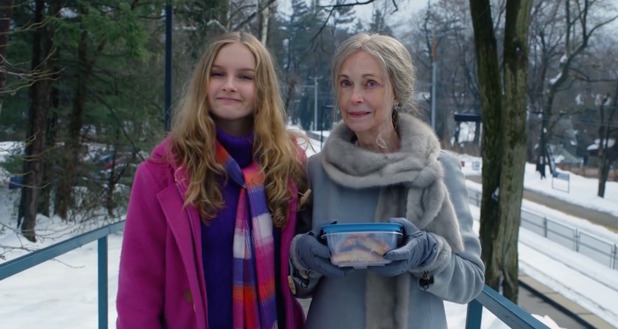 The Visit opens Friday September 11 in wide release.